Cell fusion, a process critical to fertilization, placenta formation, muscle development and other functions, is poorly understood. A key element researchers found in the process is that a cell’s skeleton senses pressure from another cell’s protrusions and responds by fortifying itself. 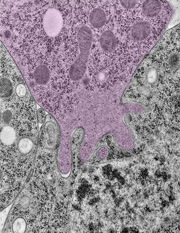 An attacking cell (pink) invades a receiving cell prior to cell-cell fusion. Just as human relationships are a two-way street, fusion between cells requires two active partners: one to send protrusions into its neighbor, and one to hold its ground and help complete the process. Researchers have now found that one way the receiving cell plays its role is by having a key structural protein come running in response to pressure on the cell membrane, rather than waiting for chemical signals to tell it that it’s needed. The study, which helps open the curtain on a process relevant to muscle formation and regeneration, fertilization, and immune response, appears in the March 9 issue of the journal Developmental Cell. The merging of two cells, which is crucial to conception, development and physiology of complex organisms, was long thought to be a symmetrical process, where two cells contribute equally. But two years ago, Chen’s research group showed that, in fact, one of the fusion partners initiates the process by extending fingerlike protrusions into the other partner. But how were the cellular skeleton’s building blocks, such as the protein myosin II, being summoned to the fusion site? To find out, Chen’s group altered cell surface proteins that are known to relay chemical signals in the receiving cells of fly embryos. “In most of the cells, we still saw myosin swarm to the fusion site, despite the fact that chemical signaling had been disabled,” Chen says. In other words, myosin is able to sense and respond to pressure on the outside of the cell. Myosin’s “mechanosensory” response was also seen when Chen’s collaborators used either a tiny pipette to apply a pulling force or a tiny probe to apply a pushing force to lab-grown cells. There is much still to learn about the cell fusion process, however. Next, Chen’s group plans to examine how pressure is conveyed from the cell membrane to its skeleton and which proteins on the membrane facilitate fusion. 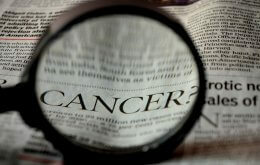 Other authors on the paper are Ji Hoon Kim, Yixin Ren, Shuo Li, Yee-Seir Kee, Shiliang Zhang and Douglas N. Robinson of The Johns Hopkins University; Win Pin Ng, Sungmin Son and Daniel A. Fletcher of the University of California, Berkeley; and Guofeng Zhang of the National Institute of Biomedical Imaging and Bioengineering. The study was funded by the National Institute of Arthritis and Musculoskeletal and Skin Diseases (grant number R01AR053173), the National Institute of General Medical Sciences (grant numbers R01GM098816 and R01GM66817), the National Science Foundation (grant number CMMI-1235569) and the Muscular Dystrophy Association.